Skype vs. Sightspeed - What's the Best Online Chat Software? Most new laptops these days include a built-in webcam that can be found at the top of the screen. The technology is so cheap these days that they are thrown in to help with video conferencing, online chat and more. In order to utilize the camera and/or microphone on your system, you will need some kind of client software that lets you make connections with others. In this article, we'll compare Skype vs. Sightspeed to see which service is better suited for your needs. 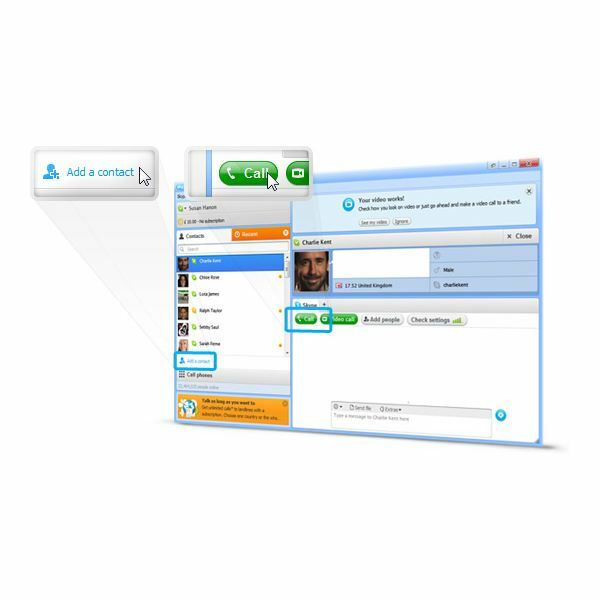 Skype is an online service that connects users for chat, phone and even video conferencing. It is available for PC and smartphones, and has a large and ever-expanding user base. It has features like free video calling, where you can chat face-to-face, like on The Jetsons, plus you can use it like a phone if you have a microphone connected to your computer. The software lets you maintain a contact list of other users so you can see who is online and run multiple connections at once, so it's great for online business meetings. Even users of this site, Bright Hub, use Skype for online seminars since we have writers from all over the world. The Skype user interface is very nicely done and is colorful and intuitive. You can set individual icons for your profile, easily search for other users, and even tie it into Facebook. It also features a browser add-on that automatically detects phone numbers on websites and turns them into links that use Skype as a dialer, so you can just click the phone number to make a call. There is a price for these premium services, but it's still free for contacting other Skype users. It's perfect for home or business use and makes for an excellent communication tool. In July 2011, Facebook announced that it was partnering with Skype to enable video chat services on the social network site. This is going to be a huge boost for Skype and further expand their market share. In this author's opinion, it takes us one step closer to rendering traditional phone companies obsolete when you can use VOIP technology to digitize phone calls and run them over the Internet. Sightspeed is a service much like Skype and is owned by Logitech, a company well known for making quality computer peripherals like webcams, mice, keyboards and more. The company was bought out in 2008 and since then the software was updated to become Logitech Vid, while this service was apparently abandoned. The Sightspeed website could really use a makeover. It looks fairly generic and touts various awards the software won, but the last one was three years ago. With it's overuse of stock photos and stale color scheme, I don't see many new customers being turned on by the first impression their site makes. Even worse, it doesn't work properly when you try to download the trial version. It asks you to choose a plan, then presents no plans, and it won't let you get past that first step. I had to use Google to do a search for 'Sightspeed download' and that took me to a Sightspeed download page that didn't appear to be linked from the front page of the site at all. I then had to fill out a form to create an account, then it finally let me get the software. Once I finally got the Sightspeed client installed and running, I was not impressed. The interface is hideous and caused eyestrain. For example, the menu system uses white text over reflective color buttons and it looks like the kind of junk you used to see on personal websites years ago when amateurs used 'button generators' to make all the navigation tabs for their site. I suppose it all makes sense when you go to the About section and see that the software hasn't been updated since 2008. Too many of the buttons within the program force a browser window to open up the Sightspeed website instead of keeping all content within the application. For example, if I wanted to view call rates, I have to let a browser window open. The same goes for trying to manage videos. Combine all that with grossly oversized fonts, and this looks like some kind of freshman year college student's programming class project interface. Needless to say, I was not impressed with Sightspeed. It was too much trouble just to get an evaluation copy, it looks very outdated, and you can't hardly do anything with it before having to pay a fee. It's no wonder that Skype has become so popular while this service has mostly been forgotten. Skype is clearly the winner here. It's updated often and widely used, whereas Sightspeed is no longer supported although Logitech never took down the website or the core functionality. If you don't like Skype, you may also consider using Logitech Vid or even free programs like MSN Messenger for online chat.